The project used to have its own website, now archived. This document might be partially outdated. 1 What is HDT ? 6 How can I try HDT ? 8 How do I configure HDT ? Current stable release is 0.3.3 0.5.2. Current development version is 0.3.4 in the main Syslinux git repository. HDT is included in the official Syslinux distribution archives. Syslinux 3.74 features HDT 0.2.7. Syslinux 3.75 features HDT 0.2.7 with a fix to prevent hard lock during pci detection. How can I try HDT ? Since Syslinux 3.74, HDT is available in the Syslinux archive under the "com32/hdt" directory. Since qemu 0.9.0, it is possible to boot a virtual machine while using a local directory as a local pxe server. This allows a local PXE booting without needing a complete infrastructure (dhcp/tftp). Setup you environment by creating a local pxe directory like "~/pxe". In this pxe dir, create another directory, named "pxelinux.cfg". Copy the "pxelinux.0" (and "ldlinux.c32") file(s) from the Syslinux archive to the "~/pxe" dir. Copy the hdt.c32 file (and the relevant library modules) in the same directory. The menu mode will try to do some best effort to manage the little space in which we display so much information. Screenshots taken on HDT 0.2.6. Make sure to use the keyword "LINUX", not "KERNEL"! Then, when selecting the memory test from the memory submenu, the "memtest" label will be launched. The label name could be changed using the "memtest=<label>" boot option of HDT. The default value is set to "memtest". How do I configure HDT ? HDT can be configured by APPENDing parameters, as described in the following sections. The "pci.ids" file can usually be found in the "/usr/share/" directory of a Linux System or just download it from sf.net. The "modules.pcimap" file is usually available in the "/lib/modules/`uname -r`/" directory of your Linux system. Warning! When HDT is used with ISOLINUX, the file name must be in an "8.3" format. So if your file is named "modules.pcimap", then the parameter given to HDT must be: "modules=path/to/modules.pci". If these files are not available, HDT will generate some information messages to warn the user. The memtest=<label> option allows users to override the default entry name in the current config file of Syslinux. The default value is set to "memtest". This syntax may change in the future. The main menu displays a "hdt> " prompt indicating the top menu. Other submenus exist: pci, dmi, cpu, kernel, pxe, syslinux. These topics will be discussed later. The "show dmi" command will display the version of the DMI table and the available modules. Vendor       : XGI Technology, Inc. The first numerical field (01, 02 or 12 in this example) represents the PCI device number followed by the vendor and product names. The second line displays the device class and the associated kernel module. If no module matches this pci device, the kernel module (Kmod) is reported as unknown. If the device matches one or more kernel modules, the Kmod field shows their name, piix or ata_piix in this example. If the device has a valid IRQ, an "IRQ: <irq>" line is displayed. HDT can show IRQs set to some PCI devices. Most PCI devices do not really have a legacy IRQ. Only valid IRQs (>0 & <255) are shown. Inside the dmi mode, "show list" displays the available modules. Note that only available modules will be displayed by this command. If your system doesn't have a battery, the battery module will not be reported. Nothing more to say except about the memory module. 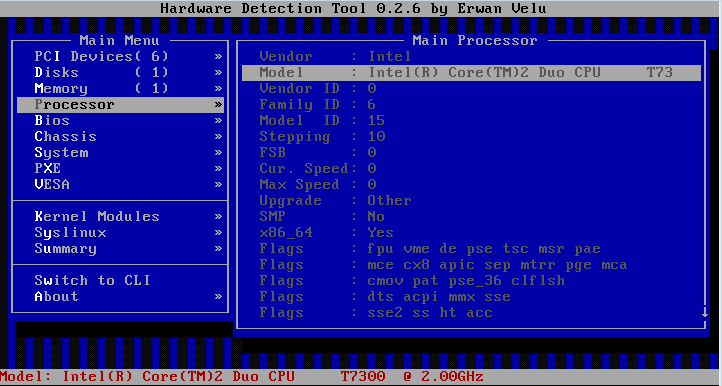 The "show memory" command will display the status of each memory bank reported by the DMI table. As reported by the command, to have more details of a given memory bank, use "show bank<bank number>". Since 0.2.6, HDT can detect whether an IPMI BMC is present; if it is, it displays the interface type, the version and its address. The kernel mode features the "show list" command that displays, for each hardware category, the needed kernel modules. The PXE mode displays information about the pxe environment. In this example, the vga card supports 32 video modes. To display them, use "show modes". Note that "Kernel mode" is the value requested by the "vga=" command line for a linux kernel. Optmizing screen usage in "show help"
Additional changes could be merged directly into the main Syslinux git repository. You can subscribe to the mailing list and/or read the archives. HDT currently detects hardware and generates an output using a menu or via a CLI. It could be interesting to add lua support to manage scripting. It could be possible to load a file that describes items that the user wants to detect. Current versions can't save a report as we can't reach a writable storage. When using PXELINUX, we can imagine using a tftp put method. Using GPXELINUX, we can imagine using some http/ftp put methods. Implementing a simple IDE stack would help in detecting PATA & ATAPI devices. Detecting SATA devices would require implementing specific drivers. The Coreboot project features some; why not doing some teaming on that? Once the previous items would be complete, it could be possible to add a smartmontools-like feature to display smart status of devices. IPMI could give HDT more information about the current hardware like sensors, etc... While using the "open" interface, we can reach the local BMC, but sounds as it needs a lot of code. Virtual Product Data displays the following: BIOS Build ID, Product Name, Box Serial Number, Motherboard Serial Number, Machine Type/Model. For every kind of component, it could be possible to launch a benchmark/diagnose tool. UBCD has many of them; why not trying to load some from both menu and CLI mode. This page was last modified on 30 November 2018, at 17:52.